Product prices and availability are accurate as of 2019-04-14 12:12:23 BST and are subject to change. Any price and availability information displayed on http://www.amazon.co.uk/ at the time of purchase will apply to the purchase of this product. 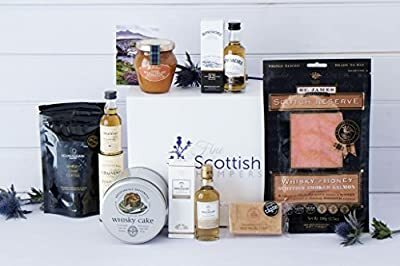 Including a selection of specially selected Scottish products, you are sure to find a tempting treat that you'll love in this Whisky Deluxe Hamper. Each product in this hamper has been specially selected to compliment any whisky from the Roundsquare Roastery Cask Coffee to Isabella's Preserves Marmalade. A treat to the senses with amazing textures to match, this hamper is a real treat for anyone who loves the taste of true Scottish Whisky.